Home » Production Engineering » What is a work order – How it is prepared in different Manufacturing Methods? In a manufacturing environment, a work order is converted from a sales order to show that work is about to begin on the manufacture, building or engineering of the products requested by the customer. 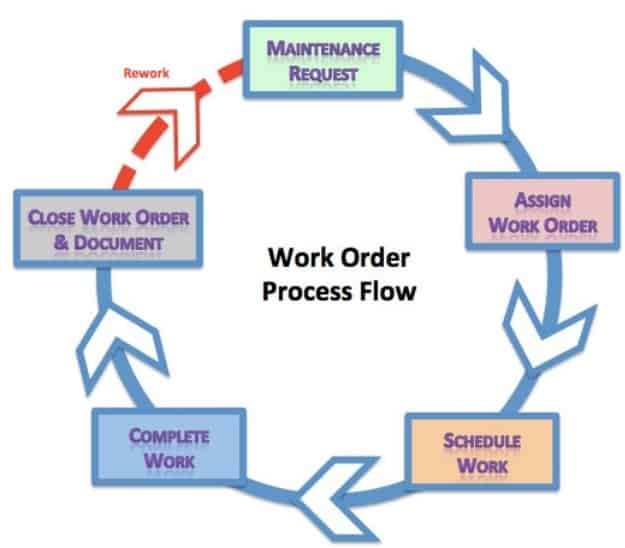 In a service environment, a work order can be equivalent to a service order where the work orders records the location, date and time the service is carried out and the nature of work that is done. The type of personnel (e.g. job position) may also be listed on the WO. A rate (e.g. Rs/hr, Rs/week) and also the total amount of hours worked and total value is also shown on the work order. The order preparation for a process depends upon products to be produced. The work order prepared includes orders for numerous manufacturing methods, shop floor job orders and inspection orders. These orders will help in deciding the amount of products to be manufactured, the quantity along which the rate of production can be estimated following the deadlines of the customer. These orders are prepared by the process planning departments are sent to shop floor directly where actual manufacturing of these parts takes place. The initially end product to be produced is broken down into smaller detailed elements so that individual drawings can be prepared with smaller elements with dimensions, part details along with bill of materials showing it’s effectiveness in production. These drawings are drafted and finally approved by the authorities of customer relationship management. These orders include order preparation for raw materials, movement from storage section to their respective departments, tooling for production that will be sequentially used on the machines. The orders are executed based upon type of layout used in plant. The shop orders similar to the manufacturing method orders are sent directly to the shop floor. A part of the diagram from the main assembly sheet or the whole product diagram is extracted and drawn to scale on a different sheet which is directly sent to the shop supervisor with relevant approval to the authority that must be manufactured on the shop floor. The process planning team makes different part diagrams like these and sends to various sections. the diagrams at the various levels of production are also prepared which are then sent to the respective sections accordingly. The inspection orders are also a part of the shop orders. Taken independently, the inspection department rates care of the entire production activity as a whole. It is a controlling procedure to check whether the parts or products being machined are within the given tolerance limits. The tolerance limit, basically is acquired with the end customers demands that must be reflected during the planning process. Thus the criteria for inspection are set by goals and objectives of an industrial engineering process.